FREMONT, Calif.--(BUSINESS WIRE)--Today, the Business Intelligence Group named AVer’s CAM540, as winner of the 2019 BIG Innovation Awards. This annual business awards program recognizes the organizations, products and people that are bringing new ideas to life. AVer’s CAM540 is a sleek, ultra-portable, 4K professional-grade USB PTZ camera optimized to deliver a dynamic video communication experience to your meeting room. Precisely engineered with smooth bearings and whisper quiet motor and an 86 degree field of view, the CAM540 delivers rapid and smooth pan, tilt and zoom motions with absolute clarity at every focal length. Organizations from across the globe submitted their recent innovations for consideration in the BIG Innovation Awards. Nominations were judged by a select group of business leaders and executives who volunteered their time and expertise to score submissions. For a list of all the 2019 BIG Innovation Award winners visit www.bintelligence.com/big-innovation-awards/. 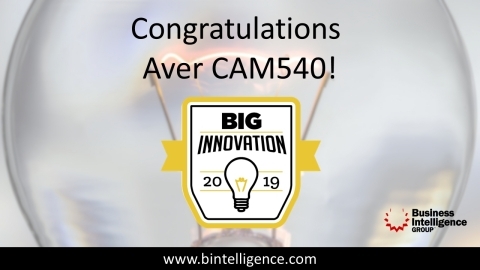 “We are honored that AVer’s CAM540 was chosen for the 2019 Big Innovation Award,” said Carl Harvell Director of Product Marketing for AVer. “Our team of experts built an amazing 4K camera with a streamlined design and quiet motor. This award is a testament to the skill, ingenuity, and vision of its creators.” For more information about AVer Information Inc. products, visit averusa.com or call (408) 813-8696. The Business Intelligence Group (www.bintelligence.com) was founded with the mission of recognizing true talent and superior performance in the business world. Unlike other industry award programs, these programs are judged by business executives having experience and knowledge. The organization’s proprietary and unique scoring system selectively measures performance across multiple business domains and then rewards those companies whose achievements stand above those of their peers. AVer (averusa.com) is an award-winning provider of visual collaboration and education technology solutions that improve productivity and enrich lives. From accelerating learning in the classroom to increasing competitive advantages for businesses, AVer solutions leverage the power of technology to help people connect with one another to achieve great things. Our product portfolio includes Interactive Flat Panels, USB Video Conferencing Camera Systems, Document Cameras as well as Sync and Charge Solutions for Mobile Devices. We strive to provide industry leading service and support that exceeds our customers’ expectations. We are also deeply committed to our community, the environment and employ stringent green processes in all we do. Learn more at averusa.com and follow us on twitter @AVerVC.